Yes, sir, I do happen to have some good photos of the rear of the Hemi engine prior to installation, right from back in the day. Actually, the choke tube routing and the clips that secure the two tubes are the same for all ’66-70 street hemi engines. 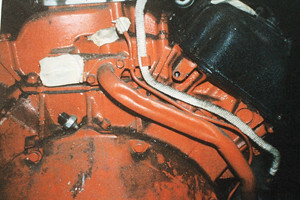 However, Hemi engines in 1971 did not use choke tubes due to the new-for-’71 manual choke design. I have some really good shots of a 1970 crated engine from Chrysler Corporation from when the engine was just coming out of the crate. It really doesn’t get any better than this. As they say, a photo really is worth a thousand words, especially a correct, accurate photo! Next, we will address the Hemi starter heat shield question. All Hemi automatics from 1966-69 used a starter heat shield; the ’66-’69 Hemi four-speed cars with the direct drive starter did not use the starter heat shield. However, all 1970 and 1971 Hemi cars (automatics and four-speeds both) used the heat shield. 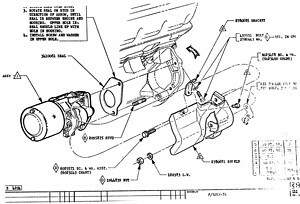 The factory schematic illustration shown here tells the story. Another thing to note is that all starters used a shim or seal between the bellhousing/auto trans case and starter. The 1966-69 four-speed direct drive starter used its own metal shim/seal, but all 1966-71 Hemi automatics and the 1970-71 Hemi four-speeds used a different shim/seal. As the schematic shows, this shim/seal goes on, then the starter; for automatics, next is the fluid tube retaining bracket, then the starter heat shield. The front upper portion of the heat shield is secured via a special bracket which is installed on the second from the rear exhaust manifold bolt during initial engine assembly. This bracket would have been painted orange when the engine itself was painted. The starter heat shields were assembled to the engine with the starter and positive battery cable, and therefore the heat shields are not engine color. All starter heat shields were painted a semi-gloss black. PHOTO: Here is the photo of the rear of a 1970-era crate motor; note the tube position and placement. While the photo is not perfect, it is vintage – this is exactly what the 1970 factory choke set-up looks like. DIAGRAM: This exploded parts diagram shows many of the components associated with the heat shielding on Hemi powerplants. As mentioned, four-speed cars from 1966-69 had the direct-drive starter and did not use the shielding; all other OEM Hemi car received it in one form or another. The article featured on this page is from the February 2010 issue of Mopar Enthusiast Magazine. If you’ve been a LeBron James sneaker fan throughout the years, the color combination of wine red and gold means ones Kobe 7 thing: Christ the King. The annual color scheme for the LeBron-sponsored high school in Queens, New York arrives this year on the Nike Paul George Shoes LeBron Soldier 10, featuring the bold strapped-up silhouette in a predominantly wine-colored upper with with gold accents and a white sole. Get your kyrie shoes first look at the “Christ the King” colorway today, and stay tuned to Sneaker News for further release details. Eastbay’s own calendar says LeBron zoom soldier 9 September 2 but that must not matter because the Under Armour Curry 2.5 ‘Rocket’ is available now for $135. If you cop, make Jordan Shoes sure to get free shipping. Eastbay may take these back down until the original release date. Beginning on Friday, September 2, the reigning NBA Shoes MVP will once again share his passion for the game with the next generation of players in Asia as he embarks on his LeBron 12 second annual Asia tour.While on the tour, Under Armour will be unveiling two new colorways of the Curry 2.5 — dubbed the ‘Journey Derrick Rose Shoes to Excellence’ Pack.The pack consists of two versions of the Curry 2.5, but they will be sold separately. They’ll be available exclusively on Kobe 11 UA Shop (both iOS and Android) on Thursday, September 1, followed by a wider launch at Under Armour Brand Houses and UA.com on Curry 2 Saturday, September 3.According to Under Armour:The “Journey to Excellence” Pack draws inspiration from “Journey to the West,” a classic Chinese novel and one Kyrie 2 of the benchmarks for historic Chinese literature. The two colorways are each named after characters from the 16th century classic:• The Sun Wukong Golden State Warriors Jerseys is inspired by the hero’s ability to overcome all obstacles, via great power that is often underestimated, just like Stephen. The Erlang Shen KD 8 colorway is inspired by the “Journey to the West” character of the same name; Shen is always super calm with laser focus, the KD Shoes For Sale same as the back-to-back MVP, with his vision to see all possibilities on the court.Check out an official look at both pairs of KD Trey 5 the Curry 2.5 featured in the upcoming ‘Journey to Excellence’ Pack below. Share your thoughts with us in the comment section. A particularly important content and articles. Really quite inspiring notebook look at this forum. I would like you to ultimately treasure quite a lot to will try you will be managed built just for doing this delightful content and articles. Already follow the Best General Contractor Westchester County A large amount of regards.